A few weeks ago, I came across a book from the 1990s called, Wherever You Go, There You Are: Mindfulness Meditation in Everyday Life. 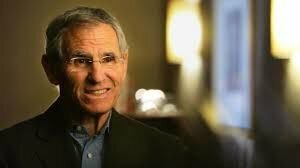 The author, Jon Kabat-Zinn, has for decades been a leader of the mindfulness movement and has introduced mindfulness into the practice of medicine. I’ve found the book a treasure as I attempt to cultivate, in very halting ways, a greater sense of presence in my own life. I read the following passage this morning. The author writes of what he called, “voluntary simplicity.” The words helped lower my pulse rate. Maybe it will have the same effect on you. “Voluntary simplicity means going fewer places in one day rather than more, seeing less so I can see more, doing less so I can do more, acquiring less so I can have more. It all ties in. “It’s not a real option for me as a father of young children, a breadwinner, a husband, an oldest son to my parents, a person who cares deeply about his work to go off to one Walden Pond or another and sit under a tree for a few years, listening to the grass grow and the seasons change, much as the impulse beckons at times. “But within the organized chaos and complexity of family life and work, with all their demands and responsibilities, frustrations and unsurpassed gifts, there is ample opportunity for choosing simplicity in small ways. Slowing everything down is a big part of this. “Telling my mind and body to stay put with my daughter rather than answering the phone, not reacting to inner impulses to call someone who 'needs calling' right in that moment, choosing not to acquire new things on impulse, or even to automatically answer the siren call of magazines or television or movies on the first ring are all ways to simplify one’s life a little. “Others are maybe just to sit for an evening and do nothing, or to read a book, or go for a walk alone or with a child or with my wife, to restack the woodpile or look at the moon, or feel the air on my face under the trees, or go to sleep early. “I practice saying no to keep my life simple, and I find I never do it enough. It’s an arduous discipline all its own, and well worth the effort. “Yet it is also tricky. There are needs and opportunities to which one must respond. A commitment to simplicity in the midst of the world is a delicate balancing act. It is always in need of retuning, further inquiry, attention. But I find the notion of voluntary simplicity keeps me mindful of what is important, of an ecology of mind and body and world in which everything is interconnected and every choice has far-reaching consequences. You don’t get to control it all.